The Scriptures teach us that Yeshua‘ (Jesus) is the same yesterday, today, and forever. Is it possible that the same could be said of our Heavenly Father? And what about the Holy Spirit? Is His work and ministry the same yesterday, today, and forever? Our Father’s instructions, with particular emphasis on the Sabbath, feasts, and dietary laws, are being restored, but in the midst of much disagreement and with even greater confusion. Something still seems to be missing in the body of Messiah. 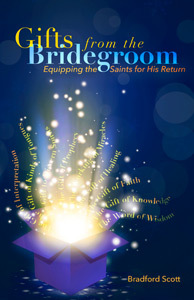 In this book, Brad takes on the gifts of the Holy Spirit, taking them back to the beginning, teaching their function and purpose for the distressing and confusing times that we live in. Brad looks at the Holy Spirit through the lens of the natural creation and each gift that flows from that same Spirit is traced back to YHVH’s (God’s) perfect order. The eBook download is compatible with Kindle, iBooks, Nook and most other readers and devices, includes both ePub & MOBI formats, and is DRM-free.